Round tomatoes cut into wedges, salted, placed out in the sun to dry slightly, seasoned with garlic and oregano and packed in oil without vinegar. 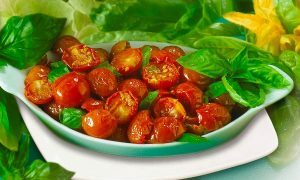 Their flavor is delicate and sweet.This is a traditional product of Southern Italy, where the tomatoes are baked in the oven and packed in jars with oil. Excellent for hors d’oeuvres, canapés, sandwiches, and hot or cold pasta dishes. Ideal with cocktails and for hors d’oeuvres. Baby onions pickled in sweet and sour raspberry vinegar. Ready to serve. 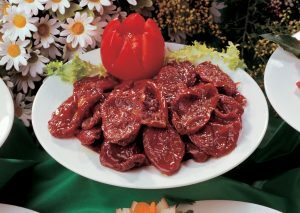 Perfect with cocktails, for hors d’oeuvres, for buffets, and for preparing canapés, shish kebabs, and side dishes. 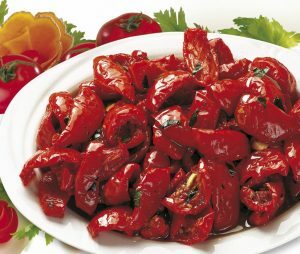 Ideal as an hors d’oeuvre or a side dish for cutlets, poached or grilled meat, or seafood. Excellent either warm or cold. Gherkin pickles preserved in a slightly sweet and sour pickling solution made with balsamic vinegar, sunflower oil, salt, and sugar. Very good with cocktails and for hors d’oeuvres, sandwiches and canapés.